Central Fisheries Research Institute, Vali Adil Yazar Cad. In ecologic studies, two main questions are to be answered in order to determine the relation-ship between predator and their food sources. The first one is in which rate predators consume its own hunt and the second one is how often they consume. The answers for these questions can mostly come up with the combination of the size of the type we study on, its digestive and metabolic rate and the feeding variety caused by environmental factors, provision of food, the ef-fect of water temperature, disease, oxygen level, salinity and light (Hall, 1987). In feeding ecol-ogy, one of the main objectives is to calculate daily food consumption of the fish. To this aim, many researchers have tried to determine the amount of food in fish stomach which is undi-gested within 24 hours after feeding time or within appropriate periods. This is also essential for the estimation of evacuation rate. The elapsed time for the rate of evacuation and for complete gastric evacuation of different fishes was exam-ined in detail by researchers (Grove and et al., 1978; Hall, 1987; Jobling, 1993). The evacuation studies on fish started in 1800s (Mölnar et al., 1967). 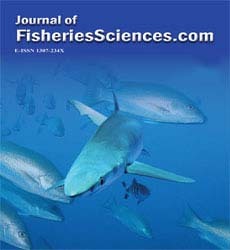 Studies in those years were mostly on the structure of evacuation channel of fish and in the following years, the evacuation physiology of many fish varieties, even of fish types without stomach, was investi-gated in a more detailed way (Steigenber et al., 1974; Grove and Crawford, 1980). In order to evacuate stomach inner side which is required in evacuation studies, five common methods are used: 1. Rapid slaughtering method; 2. –X- rays; 3. Stomach irrigation method; 4. Ra-dio isotopic method; 5. Vomiting agent use (Sağlam, 1995). Evacuation rate is simply identified as the di-gested amount of the consumed food in a certain time period. Later, evacuation rate data is used for the estimation of feed consumption rate (Tal-bot, 1985; Basimi and Grove, 1985; Bromley, 1987; Richte et al., 2003; Hallfredsson et al., 2007; Dunbrack et al., 2009). There are many factors which have impact on fish gastric evacu-ation. Of them, the most significant ones are temperature, fish size, feed type, feed amount and feed quality (Pandan, 1967; Kapoor et al., 1974; 1978; Fange and Grove, 1979; Smith et al., 1989; Andersen, 1998; Koed, 2001). The living organism needs feeding both in marine and terrestrial environment in order to sustain its life and its vital functions. Different formations appear through the metabolic activi-ties in the body of the living organism and thereby the systems- such as digestion, evacua-tion and circulatory- set out the life of living or-ganism. Compared with the other periods, physi-ological changes occurred especially in the larval period of fish are of more and greater signifi-cance. Physiologically, morphologically and histologically, fish larva alimentary canal has a more simple structure than adult fish alimentary canal. Before deutoplasm and oil drip absorption, there is primitive intestine structure. After first feeding, this structure rapidly changes. This change is related to feed variation. Many larvae are planktonics except for the feeding habits of the adult. Larvae firstly consume small size of phyto-zooplankton and then start to consume big size of live feed. Changes increase parallel to the amount of live feed and physiologic adaptation to powder feed (Hoşsu et al, 2005). Digestion enzyme activation is lower at the very beginning of feeding. However, during lar-val period, it increases in mucosal epithelia; pan-creas and liver by production based on presence of enzyme in larval feed or feed consumption. In many fish larvae, it is common to see intestine peristaltic. The silli cells in the digestion canal of the larvae form more rapidly than the adults. Evacuation rate is related to feed density and temperature. Thus, evacuation and assimilation in larval fish is rapid (Hoşsu et al, 2005). 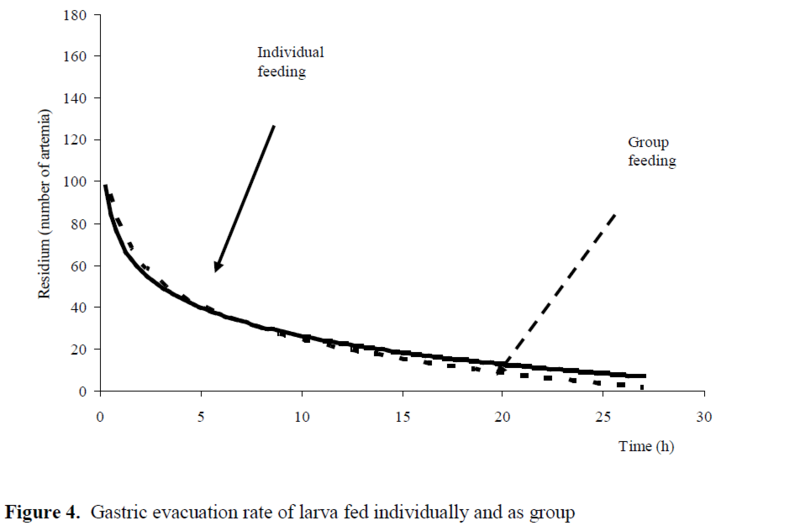 It is important to analyze the effect of feed amount in evacuation rate. It is easy to control the amount of feed intake by each fish in individ-ual feeding. Nevertheless, some types show bet-ter feeding attitude in group (Sağlam, 1995). In-dividual feeding method is restrictive in some studies when fish consume feed in specific amounts. In this study, it is aimed to identify gastric evacuation times and rates differences and feed amount for each feeding time which are of ut-most importance in terms of culture in Black Sea trout feeding individually and as group. Based on the results of this study, producers will have a chance to learn how often they should feed fish and the amount of feed they should use. In this study, 2006 reared at hatchery Black Sea trout larvae (F2) were used. Twenty-eight larvae whose length and weight were measured (0.117±0.01 g and 2.45±0.096 cm) were individ-ually placed into small test units with aeration and 1 liter fresh water. Those 28 samples were starved for three days (72 hours) and then they were fed individually at 11 °C. For each fish 4700 artemia/l was provided. 30 minutes after feeding, residual feed was removed from experi-mentation units. With regard to sampling time, the sampling after 30 minutes was the first and named as 0. sampling. The time for sampling was set as 0-4-8-12-16-20-24 and the 27th hour. The first sampling was performed 30 minutes after feeding and others were made out in intervals for each 4 hours. Samples were firstly made faint (20 ppm bencozaine) and then transferred to labora-tory in 5% formaldehyde. After the sampling, the stomachs of the salmon trout were cut and artemias in them were counted under microscope. By first observation of feed in stomach, the com-plete evacuation time of feed was recorded. Ad-ditionally, meantime was identified as gastric evacuation time (Steigenber, 1974; Macdonald et al, 1982; Fletcher et al, 1984). In order to identify digestion rate a sample was taken each four hours, stomach was taken out and contents were estimated. By using this data, the drawn evacua-tion time and slope of line which was about re-duction of prey numbers in stomach was found. The slope of line shows digestion rate at that prey density. A second experiment was designed in order to find out the difference in the gastric evacuation time and rate in group and individual feeding. Again at 11°C in 1 liter research units, the sam-ples were fed in group (n=25) with artemia (8385 artemia/l). The sampling was performed at the same hours as made in individual feeding and artemia in stomachs was counted under micro-scope. All data were evaluated in Excel® and vari-ance analysis was done in Statistica® and used P<0.05. It is observed that larvae fed individually completed gastric evacuation in 24 hours. Feed amount in stomach at the 0th hour ranges from 12 to 163 artemia. Gastric evacuation rate is found as 0.0505 artemia/hour (r2=0.27) (P<0.05) (Figure 1). Since the reduction of artemia in stomach depends on time and it is exponential, digestion rate is estimated by % logarithmic estimation of remaining artemia in stomach. In individually feeding research, it was ob-served that 93% of larvae have full stomach, 7% of larvae have empty stomach. Compared to individual feeding, it was ob-served that in group feeding larvae consumed 2-99 artemia. It was found out that gastric evacua-tion time was completed at the 27th hours and gastric evacuation rate was 0.0661 (r2=0.90) (P<0.05) (Figure 2). While the first bait eaten lasted for 24 hours in individual feeding with average 80±0.54 artemia and 0.0505 artemia digestion rate; in group feeding, 79.5±25.33 artemia with 0.0661 artemia /hours was digested at the 27th hours in stomach. Statistical analysis for digestion rate were to be found significant for both experiments (P<0.05) (Figure 3), (Figure 4). In group feeding, it was observed that 80% of fish stomach was full, 20% of fish stomach was empty. Digestion function in many fish varieties was searched. Reduction of stomach contents de-pending on time is well-defined as directional digestion function by Jones (1974). While evacu-ation of small organism which has lower energy contents and easily evacuated is defined with ex-ponential function; the digestion of those whose energy content is higher than the other small or-ganisms like worm was identified by linear func-tion (Persson, 1979; Elliot, 1972; 1966; Jobling, 1987). When feed surface area is wide, evacua-tion speed becomes slower than the same amount of feed which are formed by small parts. In this case, it is defined with linear or square model in the best way (Pandian, 1967; Lambert, 1985). It is realized that feed type, water temperature and long term starvation affect evacuation rate of trout (more than 7 days). In a research on river trout, it is indicated that feed type has effect on evacuation rate, compared to caddis larva, in rainbow trout the whole evacuation rate lasts more with oligochaetes and gammarus feed (El-liot, 1972). In lower temperature, feed intake of fish can stop; however, due to the increase in temperature feed consuming can increase as well. Eliot (1975) states that in his study on brown trout, feed intake increases due to the increase in temperature. It is also stated that after feed intake reaches top, any increase in temperature can cause decrease in feed intake. Many researchers point out that through the identification of gastric evacuation rate daily feed consumption can be easily estimated (Elliot, 1972). Elliot (1972) identified that in his research on brown trout, gastric evacuation rate is expo-nential depending on temperature. He also deter-mined the evacuation time and rate as a mathe-matical model in different fish size by different feed at different temperature. The reduction of feed in stomach depending on time was observed exponentially and in this study similar result was observed too. Atlantic salmon are used to live in groups Thus, lack of feed caused individual feed intake (Fenderson, 1968). The gastric evacuation rates of brown trout Salmo trutta (0.9–1.6 kg) feeding on fingerling rainbow trout, Oncorhynchus mykiss (3.5–7.6 g), were measured in the labora-tory at five temperatures (4.5, 9.0, 14.0, 19.0, and 22.5°C). Instantaneous gastric evacuation rates (Re) increased exponentially with temperature r2 = 0.98. Linear regressions described the relation-ship between time and qualitative measures of fish digestion, thus allowing investigators to de-termine how long an ingested fish would be identifiable at different temperatures. An analysis of published evacuation rates (n = 121) of 22 fish species indicated that both temperature and prey size (PS, g wet weight) significantly affected di-gestion r2 = 0.52. Predator size did not signifi-cantly affect rates of evacuation (Wayne and Wurtsbaugh, 1993). As a result, in this study, daily minimum and maximum amount of live feed intake of larva was found out both in individual and group feeding. Taking into account that the living organism is fed individually in nature and in-group in agua-culture facilities, the statistical analysis between the gastric evacuation rates (for individually and in-group) and time was found to be significant (P<0.05). As a result of this research, it was found out that the individual gastric evacuation is 24 hours and the digestion time in group feeding is 27 hours. 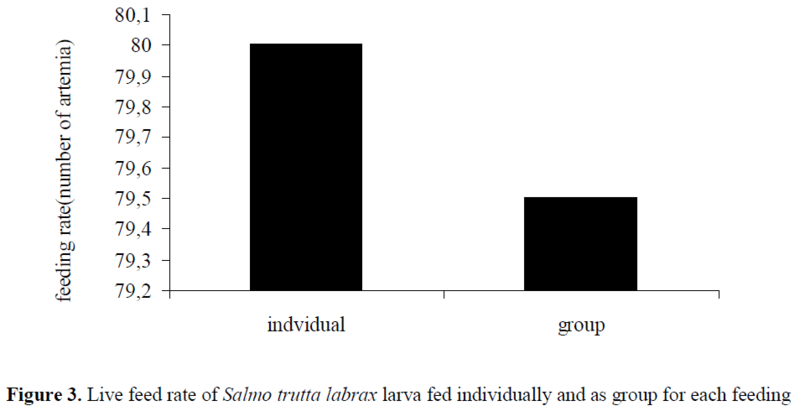 It is better to feed larva with live feed following larva yolk sac consumption within 2-3 hours owing to the fact that all individuals cannot intake same amount of feed at the same time (stomach stands empty 7% in individually feed-ing and 20% in group feeding) when individual differences are taken into consideration in larval period in which the living organism need more food. This research is done for the project for pro-motion of Black sea trout (Salmo trutta labrax PALLAS, 1811) to Private Sector. The number of the project is TAGEM /HAYSÜD/2006/09/03/02. Basimi, R.A., Grove, D.J. (1985). Estimates of daily food intake by a shore population of Pleuronectesplatessa L. of Eastern Angle-sey, North Wales, Journal of Fish Biology, 27: 505-520. Elliott, J.M. (1972). Rates of gastric evacuation in brown trout, Salmotrutta L., Livewater Biology, 2: 1-18. Elliott, J.M. (1975). Weight of food and time re-quired to satiate brown trout, Salmotrutta L., Livewater Biology, 5: 51-64. Fange, R., Grove D. J. (1979). Fish Physiology, W.Hoare, D.J. Randall, J.R. Brett, Academic Pres, Newyork. Grove, D.J., Crawford, C. (1980). Correlation between digestion rate and feeding fre-quency in the stomacless teleost, Belnniuspholis L., Journal of Fish Biology, 19: 63-71. Hossu, B., Korkut, A.Y, Kop, F.A. (2005). Feeding Fish and Technology. EagenUni-versity No:50, 257p, Izmir. Mölnar,G., Tamossy, E., Tölg, L. (1967). The gastric digestion in living predatory fish, The biological basis of livewater fish pro-duction, S.D. Gerkin, Blackwell scietific Publications, Oxford. Persson, L. (1979). The effect of temperature and different food organisms on the rate of gas-tric evacuation in perch (Percafluviatilis), Livewater Biology, 11: 131-138. Saglam, N. S. (1995). Feeding physiology on whittting (Merlangiusmerlangusexinus, 1830), Karadeniz Technical University, The graduate school of natural and applied sci-ences. Msc Thesis 53p, Trabzon. Talbot, C. (1985). Laboratory methods in fish feeding and nutritional studies. Fish ener-getics, Tyler, P. Ad Calow P., Croom Helm Ltd., Sidney.